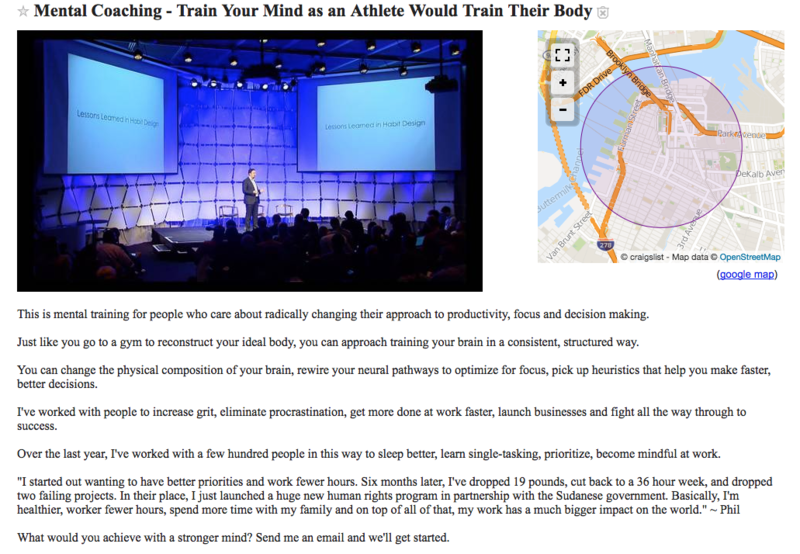 In this exercise, you'll test the entirely free Craigslist system. Your results will depend on where you live, so you should be prepared to test for a month and then make a decision about whether this is a good marketing channel for you. 1. Set up your own online office hours time slot each week. You're going to use this to vet Craigslist leads and avoid long strings of scheduling emails. We recommend the Appear.in service. 2. Write and post a Craigslist ad. We'll provide a template. 3. Repost the ad daily for a month. 4. Write a canned response sending people to your office hours. We'll provide a template for you. Use this canned response anytime someone from Craigslist reaches out. 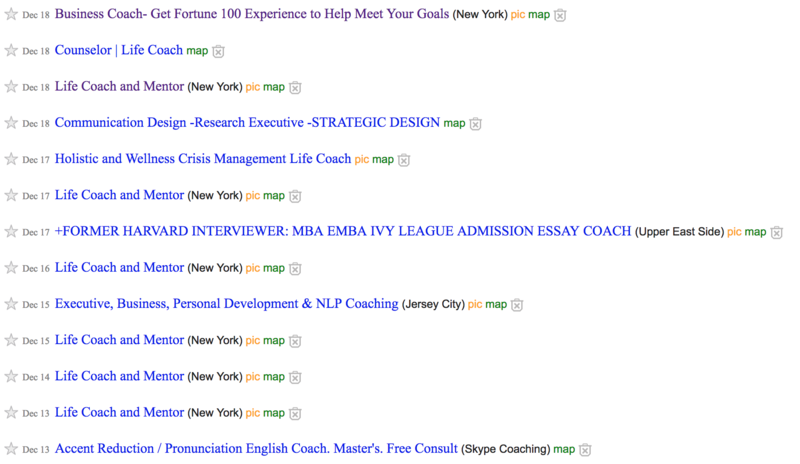 What you want to happen is to always have your ad show up for the current day in your local Craigslist. The list below is for Brooklyn and you can see that one of the benefits of Craigslist is that you aren't in competition with very many coaches. As an aside, the entire Bootcamp takes advantage of the power of specificity. You use Craigslist to target a tiny niche market: your home town. And by doing that, you take a huge leap toward being the #1 coaching option. Craigslist won't send you a new client every day, but you should expect 1-5 qualified leads every month. If that happens, then this is a fantastic boost to your business. 1. Go to the Craigslist website. Most often, it will automatically detect what town you should be posting in. 2. Follow the Post to Classifieds link. Craigslist will put you through an account signup flow and ask you what category you want to post in. The most likely category is Services > Lessons & Tutoring. 3. Make a post that a single image and your sales pitch. A good choice of image is your Coach.me cover image. Here is a template for your own posting. As usual, we use the WISH Framework (What, Inspirational fantasy, Social proof, How you coach). What would you achieve [Inspirational Fantasy]? Send me an email and we'll get started. If the person responding treats you like you want to be treated and puts effort into responses, then match them. If they do not treat you well, then ghost them. Don't respond and don't lose any sleep or productive time over it. The way we recommend handling unvetted leads is by setting up an online office hours. If people show up, then they are serious. And also, if they show up, then you'll know you are very close to making a sale. The letter below can be used almost verbatim to respond to every person who contacts you through Craiglist. We use Appear.in as our recommended video chat platform because it usually requires no downloads or account signups. None of the options are perfect, Appear is our fav. In return, I'll be ready to share myself, answer your questions, and help you make a yes or no decision about whether a coaching relationship with me is the solution to your goals. Please put that in your calendar. 1. It filters out clients who aren't serious. 2. It saves you the time consuming task of setting up mutually agreeable meetings with clients who you haven't vetted yet. Otherwise, 95% of your time will be spent trying to schedule time with someone who is going to flake on you. To keep your post current, you need to go into Craigslist to delete the post and re-post it again as a new post. Yes, this is the official way to do this.